Red leather bookmark with gold printed quote and Anthony Trollope 200 logo. 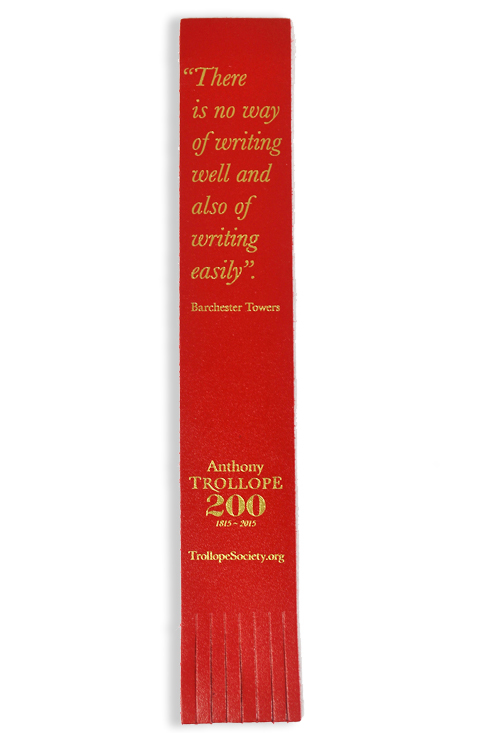 Celebrate the 200th anniversary of the birth of Anthony Trollope with this red leather ‘Anthony Trollope 200’ bookmark. Trollope’s famous quote from Barchester Towers is printed in gold lettering, reminding you of the labours of any novelist as you enjoy their work. You don’t have to be a member of the Trollope Society to purchase this item. All profits go towards helping us promote the reading and enjoyment of the works of Anthony Trollope.